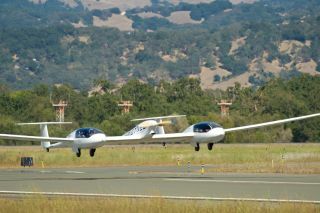 The Taurus G4 electric aircraft takes off during the 2011 CAFE Green Flight Challenge in Santa Rosa, Calif., on Sept. 26, 2011. The Taurus G4 was built by a team called Pipistrel-USA.com, which took home the $1.35 million top prize. NASA has doled out the largest prize in aviation history, in an effort to help make future aircraft cleaner and greener. A team called Pipistrel-USA.com, of State College, Pa., has taken home the $1.35 million top prize, NASA officials announced Monday (Oct. 3). The space agency helped organize a competition called the CAFE Green Flight Challenge, which tasked teams to design, build and demonstrate super-efficient aircraft. Team eGenius, of Ramona, Calif., came in second and scored $120,000. Both top finishers demonstrated working electric planes. Fourteen teams registered for the competition, whose guidelines instructed them to build aircraft that could fly 200 miles (322 kilometers) in less than two hours using less than one gallon of fuel per passenger, or the equivalent in electricity. Three of the original 14 teams met these requirements and competed in a fly-off over the past week near Santa Rosa, Calif. Both Pipistrel-USA.com and eGenius flew the 200 miles using just over a half-gallon of fuel equivalent per passenger, NASA officials said. "Two years ago the thought of flying 200 miles at 100 mph in an electric aircraft was pure science fiction," said Jack Langelaan, team leader of Team Pipistrel-USA.com. "Now we are all looking forward to the future of electric aviation." The competition marked the culmination of more than two years of work for the teams involved. Collectively, the competing teams spent more than $4 million to design, develop and test their aircraft. The technologies demonstrated during the challenge could find their way into commercial aviation in the future, officials said. The competition was managed by the Comparative Aircraft Flight Efficiency (CAFE) Foundation under an agreement with NASA. It was sponsored by Google.